Lagos state is a land of opportunities. It is the commercial capital of Nigeria with unofficially a population of 23 million people 'hustling' to have a bite of the good fortunes of the land. 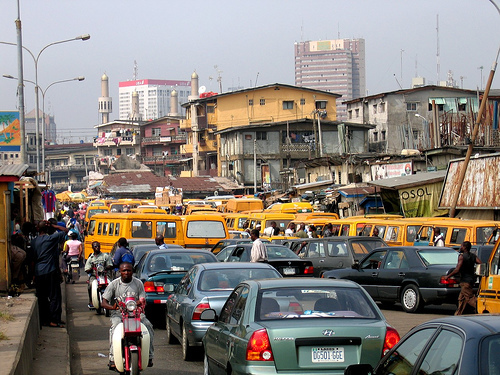 Lagos has a couple of adverse sides a newcomer will have to adapt to and live with. Lagos is highly populated with thousands of people plying limited road networks to work early in the morning and also returning late in the evening. There have been several cases of people spending over 5hrs in traffic merely moving from Mainland to the Island in Lagos. This poses a huge challenge in the movement of goods and services. Rent in Lagos is very expensive. Most landlords will only rent their houses out if you are ready to pay a 2-year rent. You go through agents who will demand a large sum of money. The 'agreement fee' at times is much enough to rent a two bedroom flat in a cheap area like Ibadan. After the stress of working in Lagos for the day, one would need expert hands to massage all the back pains. The girls in Lagos only understand the language of your pocket and not empty promises of love. Some ladies could demand for Buhari's head for the night. The beggars in Lagos come in different dimensions. Someone can appear smarter and more expensive than you in Lagos and still beg you for money. They constantly stop you with pitiful stories and faces. Ignoring them sometimes has a way of affecting one's conscience especially if you are the soft type. I never knew traffic robbery was real until I came to Lagos. CMS, Mile 2, Ikorodu, Orile, Iyana Oba and several other areas have high records of traffic robbers who dispose commuters of their hard-earned belongings. Towards the yuletide, Linda's blog was reporting almost two cases of traffic robbery per day. In Lagos people tend to draw a scale of preference on movement. Movement to work is mandatory while others can wait except too important due to the high cost of moving around. For this reasons, most friendships are relegated to online interactions and nothing more. Lagos is too congested with people. The town planning system of some areas like Satellite town in Amuwo Odofin, Mushin, Okokomaiko, Ajegunle, Oyingbo etc is very poor which affects the ventilation in houses. This could frustrate a newcomer especially when the weather is sunny. A close study of some churches in Lagos has brought me to the conclusion that some preachings are directed at the congregation's pockets. The churches are always in need of one thing or the other. The speakers psyche you up to even drop what you don't have by faith. You need to see the cars driven by some people especially on the Island part of Lagos. It takes discipline for your long-term lover to say no to such men. The desperation of joining the wealthy class could push one to destruction. These people may not even work as hard as you do or even have the same educational qualifications with you. That club girl that was dancing like a possessed person at the club on a Friday night with that skimpy cloth that puts her endowments on display maybe the sister leading the praise and worship session in a church on Sunday. Everyone takes up different characters just to bring the money home and pay bills.